The expansion of wind power capacity across the globe increased 16 percent or 51,477 megawatts in 2014 to reach a record 370,000 megawatts, the Austrian Wind Energy Association said Thursday. Last year witnessed the highest increase in terms of newly added capacity for a single year, said Stefan Moidl, head of the organization. China was the global front-runner in wind energy expansion, with its generation capacity increasing about 23,000 megawatts in 2014. In 2013 it added 16,000 megawatts. Asia as a whole also overtook Europe as the leading continent in wind power capacity in 2014. It added a total of 142,000 megawatts in the year, while Europe added almost 134,000 megawatts. 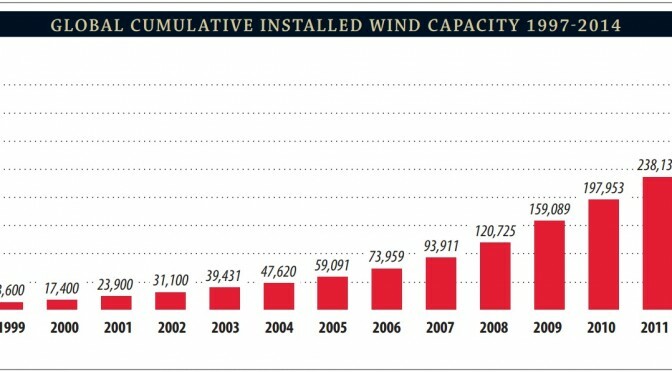 Moidl lamented the lack of continued wind power development in Europe, saying it has almost stopped in some countries. He noted that for a significant period of time Europe produced almost all wind turbines, but now Chinese manufacturers cover almost half of all expansion.